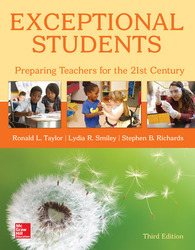 Exceptional Students: Preparing Teachers for the 21st Century provides balanced coverage of the foundations of exceptionalities future teachers need to know to understand their students and responsibilities. The third edition has been further updated to reflect the role of the special educator, while continuing to address the role of the general educator in serving special populations. How Many Exceptional Students Are There? What Is the History of Special Education? How Have Litigation and Legislation Affected Special Education? What Are Some Current and Future Issues in Special Education? How Are Exceptional Students Initially Identified as Having a Possible Exceptionality? What Are the Prereferral Process and the Referral Process? How Do Students Become Eligible for Special Education? How Is an Exceptional Student’s Educational Program Developed? What Are Best Practices for Collaboration between Schools and Families? What Are Best Practices for Collaboration among School Personnel? What Are Best Practices for Collaboration between Schools and Communities? What Are the Foundations of Learning Disabilities? What Are the Causes and Characteristics of Learning Disabilities? How Are Students with Learning Disabilities Identified? What and How Do I Teach Students with Learning Disabilities? What Are Other Instructional Considerations for Teaching Students with Learning Disabilities? What Are Some Considerations for the General Education Teacher? What Are the Foundations of Intellectual Disabilities? What Are the Causes and Characteristics of Intellectual Disabilities? How Are Students with Intellectual Disabilities Identified? What and How Do I Teach Students with Intellectual Disabilities? What Are Other Instructional Considerations for Teaching Students with Intellectual Disabilities? What Are the Foundations of Emotional and Behavioral Disorders? What Are the Causes and Characteristics of Emotional and Behavioral Disorders? How Are Students with Emotional or Behavioral Disorders Identified? What and How Do I Teach Students with Emotional or Behavioral Disorders? What Are Other Instructional Considerations for Teaching Students with Emotional or Behavioral Disorders? What Are the Foundations of Communication Disorders? What Are the Causes and Characteristics of Communication Disorders? How Are Students with Communication Disorders Identified? What and How Do I Teach Students with Communication Disorders? What Are Other Instructional Considerations for Teaching Students with Communication Disorders? What Are the Foundations of Deafness and Hard of Hearing? What Are the Causes and Characteristics of Deafness and Hard of Hearing? How Are Students Who Are Deaf or Hard of Hearing Identified? What and How Do I Teach Students Who Are Deaf or Hard of Hearing? What Are Other Instructional Considerations for Teaching Students Who Are Deaf or Hard of Hearing? What Are the Foundations of Blindness and Low Vision? What Are the Causes and Considerations of Blindness and Low Vision? How Are Students Who Are Blind or Have Low Vision Identified? What and How Do I Teach Students Who Are Blind or Have Low Vision? What Are Other Instructional Considerations for Teaching Students Who Are Blind or Have Low Vision? What Are the Foundations of Physical and Health Disabilities? What Are the Causes and Characteristics of Physical and Health Disabilities? How Are Students with Physical or Health Disabilities Identified? What and How Do I Teach Students with Physical or Health Disabilities? What Are Other Instructional Considerations for Teaching Students with Physical or Health Disabilities? What Are the Foundations of Autism Spectrum Disorders? What Are the Causes and Characteristics of Autism Spectrum Disorders? How Are Students with Autism Spectrum Disorders Identified? What and How Do I Teach Students with Autism Spectrum Disorders? What Are Other Instructional Considerations for Teaching Students with Autism Spectrum Disorders? What Are the Foundations of Severe Disabilities? What Are the Causes and Characteristics of Severe Disabilities? How Are Students with Severe Disabilities Identified? What and How Do I Teach Students with Severe Disabilities? What Are Other Instructional Considerations for Teaching Students with Severe Disabilities? What Are the Foundations of At-Risk Conditions? What Are Factors That Place Children At Risk? How Are Children Who Are at Risk Identified? What and How Do I Teach Students Who Are At Risk? What Are Other Instructional Considerations for Students Who Are At Risk? What Are the Foundations of Attention Deficit/Hyperactivity Disorder? What Are the Causes and Characteristics of Attention Deficit/Hyperactivity Disorder? How Are Students with Attention Deficit/Hyperactivity Disorder Identified? What and How Do I Teach Students with Attention Deficit/Hyperactivity Disorder? What Are Other Instructional Considerations for Teaching Students with Attention Deficit/Hyperactivity Disorder? What Are the Foundations of Gifts and Talents? What Are the Causes and Characteristics of Gifts and Talents? How Are Students Who Are Gifted and Talented Identified? What and How Do I Teach Students Who Are Gifted and Talented? What Are Other Instructional Considerations for Students Who Are Gifted and Talented?